LIST transfers GECAMed software to ABACUS Consulting & Solutions S. A. On 1 January 2018, 12 years after the initial IT developments, the medical practice management software GECAMed®, developed by the Luxembourg Institute of Science and Technology, has been transferred to ABACUS Consulting & Solutions S.A., a commercial enterprise in Luxembourg. Luxembourgish context. The developments begun in this last decade have paid off since GECAMed® is used by almost 10% of Luxembourgish doctors as well as by all medical centres (maisons médicales) in Luxembourg. GECAMed® was no longer the object of any true innovations after reaching technological maturity and being integrated into the eSanté platform in November 2015. With this step, researchers achieved their final development objectives by providing healthcare professionals with a tool capable of using the shared patient records (DSP) in a userfriendly and transparent way. 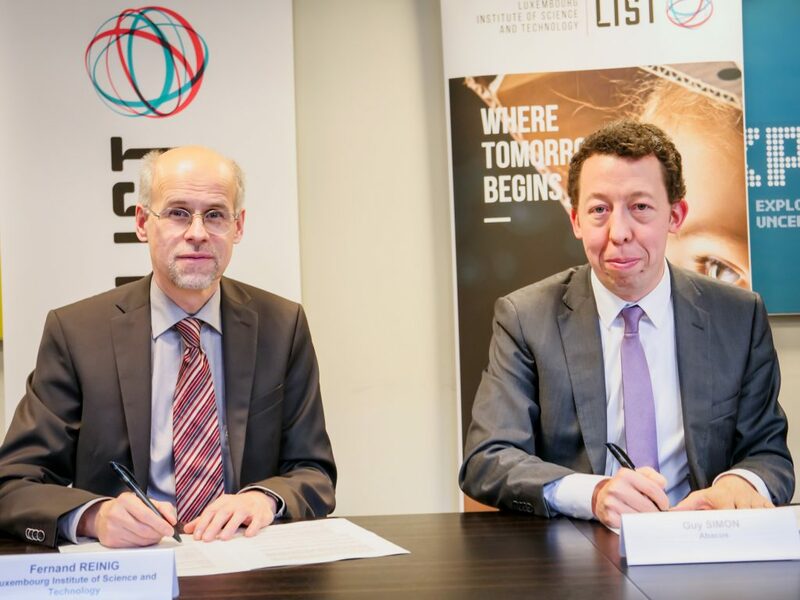 From this point on, LIST’s role was focused mainly on software maintenance. After recognizing that maintaining and continuing to develop software in a competitive market is not the vocation of a research and technology organization like LIST, it was a natural decision to transfer GECAMed® to a service provider. and IT business solutions. As official support provider of GECAMed® since 2016, ABACUS was a natural choice of candidate for its takeover. The agreement signed between the two parties confirms the open-source character of GECAMed®, whose source codes and standardized import and export formats for patient files remain public. Finally, future GECAMed® developments will be carried out according to the add-on principle, making it possible to add new functionalities identified together with users. In order to make the software transfer to the company as smooth as possible, LIST researchers trained ABACUS employees in the specificities of their software. ABACUS now has detailed knowledge in terms of GECAMed® functionality and its technical architecture. The takeover of the software by ABACUS is a chance for GECAMed® to remain at the cutting edge of the needs and requests of the market. Upcoming developments and future functionalities will also support Luxembourgish doctors in terms of the new Luxembourgish legislative obligations they will face in 2018, in particular, the obligation to use a double-entry bookkeeping method. Since January 1st 2018, ABACUS proposes a version of GECAMed® adapted to the needs of professional users. This version comprises not only extended functionalities but also the associated support. It will be complemented in the future by a range of professional services specially adapted to the needs of doctors and tailored to the specific requirements of medical practices: IT consulting in terms of data protection, IT materials and equipment for practices, adapted training and installation and configuration of the software. ABACUS thus provides Luxembourgish doctors with an all-in-one offer for their practices’ IT requirements based around GECAMed®. In addition, ABACUS also proposes customized development for doctors’ and practices’ in order to cover their individual needs. An open-source version of GECAMed will continue to be available, with a focus on research, education and non-profit purposes. This version will however not have the complete range of functionalities offered in the professional version.